(Nanowerk News) Muscle twitching, lactose digestion, blood movement -- what could possibly connect these body functions? You may be surprised to learn that all these processes and many more are driven by metal ions. Sodium (Na+), potassium (K+), calcium (Ca2+) and magnesium (Mg2+) might be household names, but they are also critical to the function of human cells. The combination of these ions with bodily proteins creates complexes that are imperative to our continued existence. The importance of proteins and metal ion interactions is well understood, but the mechanistic interactions between the two are still far from a complete picture. Zhifeng Jine, Rui Qi, Chengwen Liu and Pengyu Ren, professors in the biomedical engineering department at the University of Texas at Austin, are working to quantitatively describe protein-ion interactions using what is called an atomic multipole optimized energetics for biomolecular applications (AMOEBA) force field. 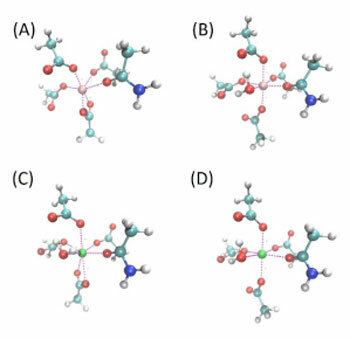 They describe their work in this week’s The Journal of Chemical Physics ("Study of interactions between metal ions and protein model compounds by energy decomposition analyses and the AMOEBA force field"). AMOEBA technology was developed by Ren and Jay Ponder, from the University of Texas at Austin and Washington University in St. Louis. It uses a polarizable atomic multipole model to calculate the potential energy of a system. The AMOEBA model aims to address known inadequacies of current force field technology to accurately model ion and protein interactions. AMOEBA improves on classically based biomolecular simulations, whose models represent the intermolecular interaction using the sum of two forces, according to Ren: the van der Waals interaction and the Coulomb interaction between point charges. Ren and his colleagues looked specifically at the interaction of Mg2+/Ca2+ and amino acids. Magnesium and calcium are some of the most abundant ions in metalloproteins, proteins with a metal ion cofactor. Both are selectively bound to specific amino acids, making them interesting target molecules. The many-body response, the mutual induction between ions and their surrounding residues within the protein binding pockets, also impacts the binding affinity of these ion and can be captured by the AMOEBA model. The AMOEBA model and the advancements of force fields, including applications of these results, Ren pointed out, are relevant in many diseases including cancer and neurodegenerative disorders. Knowledge of protein-ion interactions can provide foundational understanding for the advancement in related medical researches.